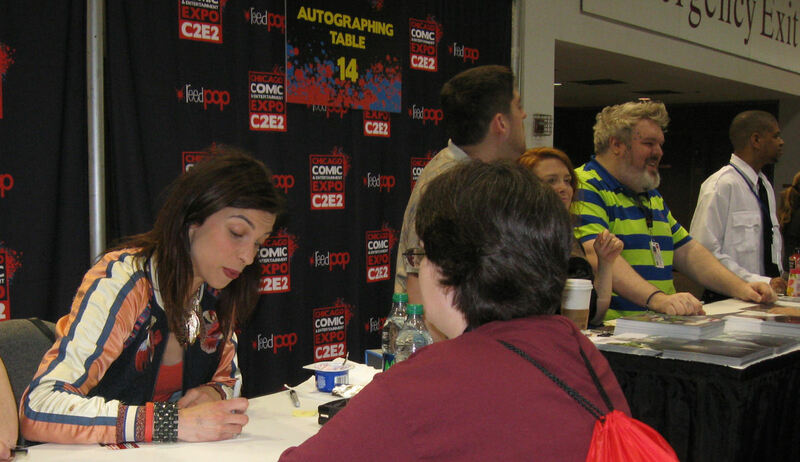 C2E2 2014 Photos, Part 4 of 4: Creators, Actors, One Panel, and More! « Midlife Crisis Crossover! 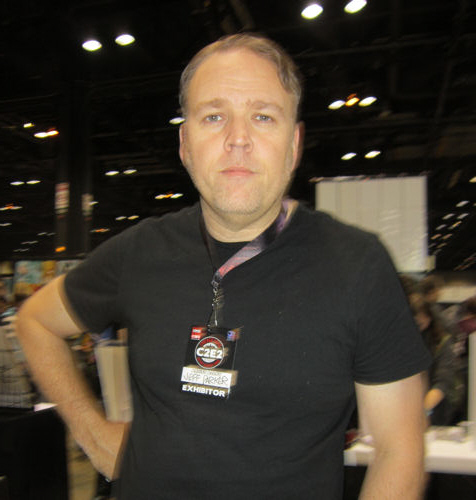 C2E2 2014 Photos, Part 4 of 4: Creators, Actors, One Panel, and More! 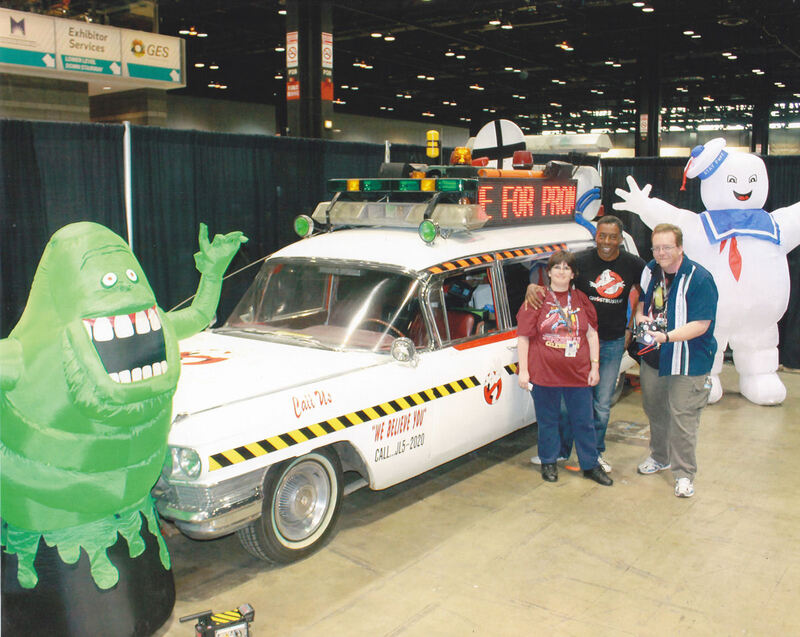 Previously on Midlife Crisis Crossover: photos from the fifth annual C2E2 convention in Chicago. 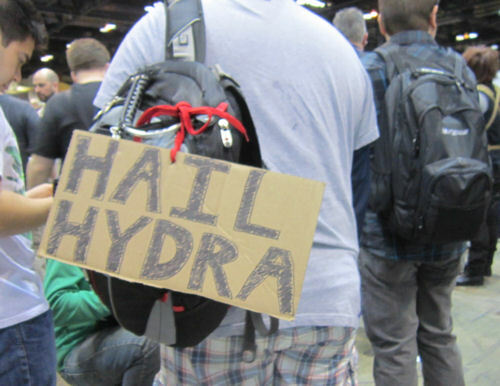 In this final installment: what we did at C2E2 when we weren’t applauding cosplayers. 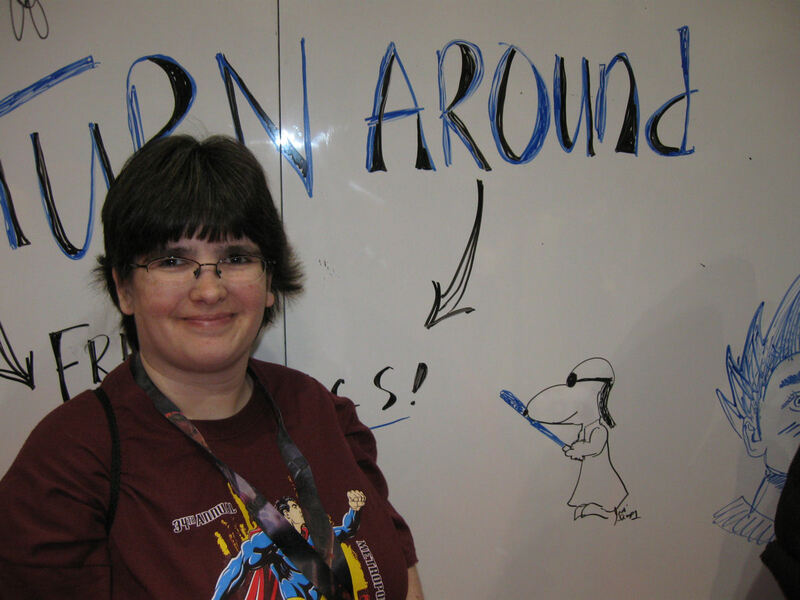 Our first act upon walking onto the show floor: approaching the giant whiteboards (markers were provided) and letting my wife Anne add a Jedi Snoopy to the walls that would collect fan art throughout the day. 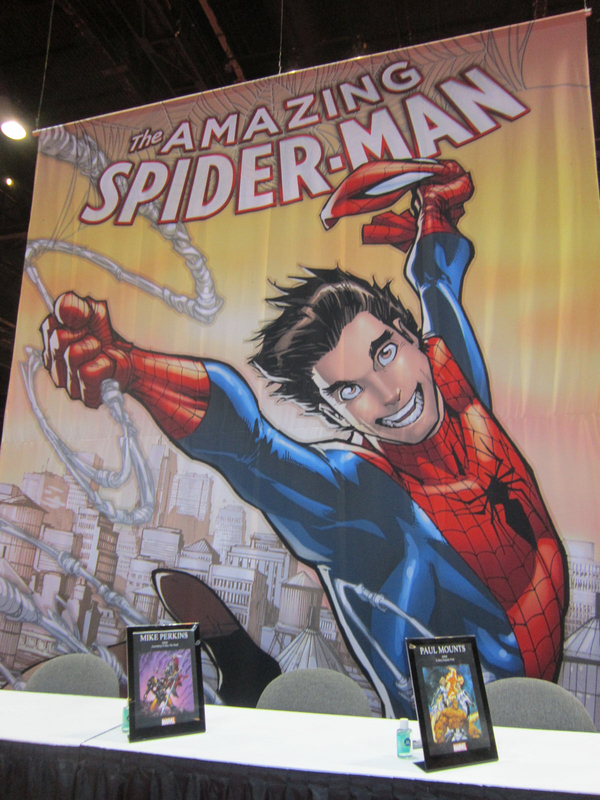 Marvel Comics had the largest booth of all the publishers who were gracious enough to attend and validate the existence of us Midwest fans, unlike some publishers of Justice League or The Walking Dead that we could mention. 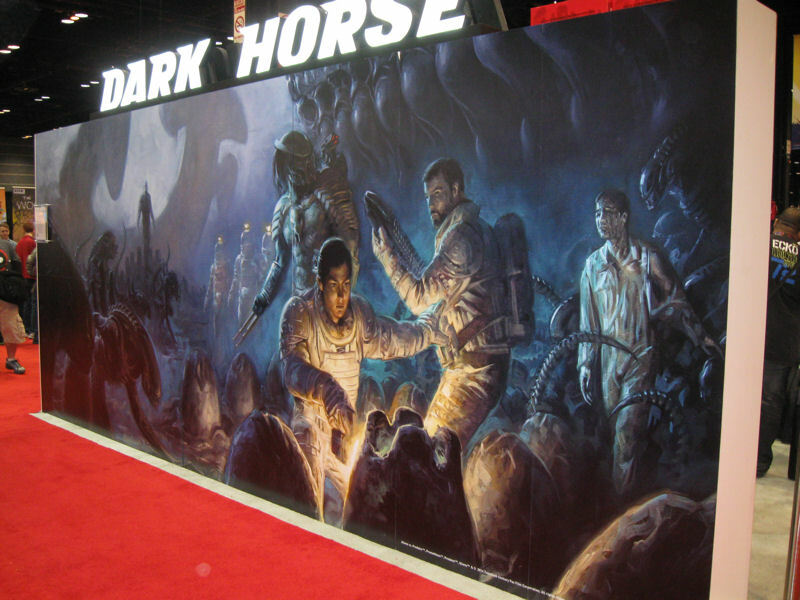 Dark Horse likewise still loves us and acknowledges our existence. 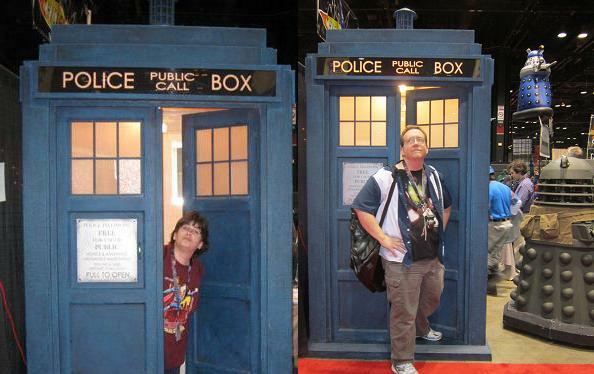 Dueling TARDIS exits, made possible by Alien Entertainment’s Doctor Who Store booth. Another pride and joy of theirs: “Ironsides” from season five’s “Victory of the Daleks”. 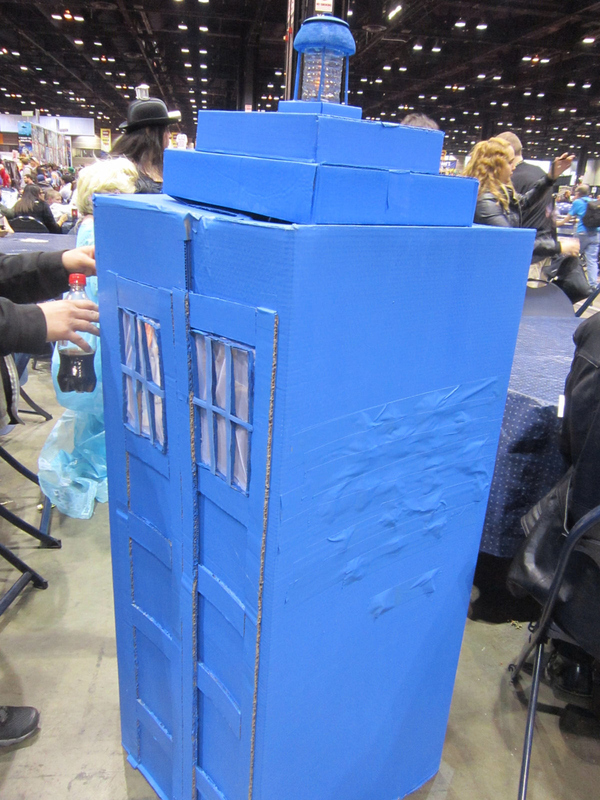 Not every TARDIS is constructed with an equal budget, but the deep fan appreciation is always there. 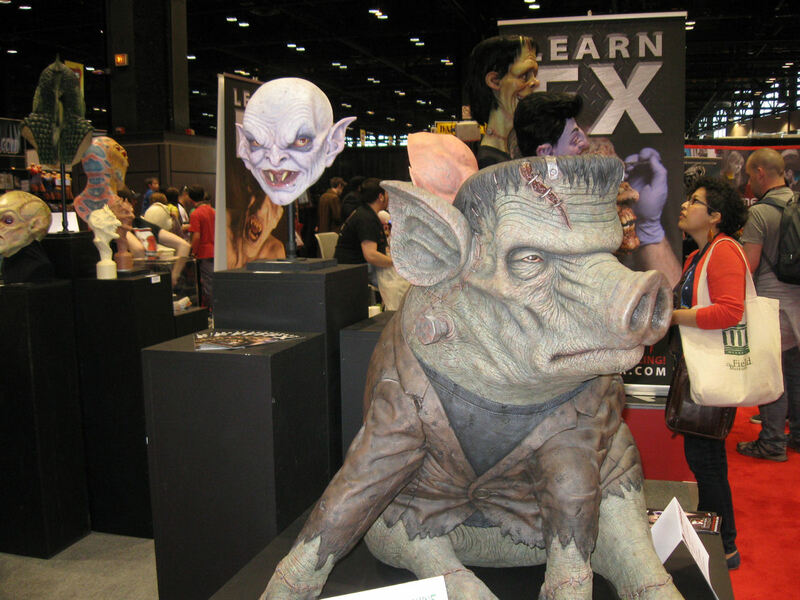 Kosart Effects presents Frankenpig and other creations by J. Anthony Kosar, the season-four winner of Syfy’s Face Off. 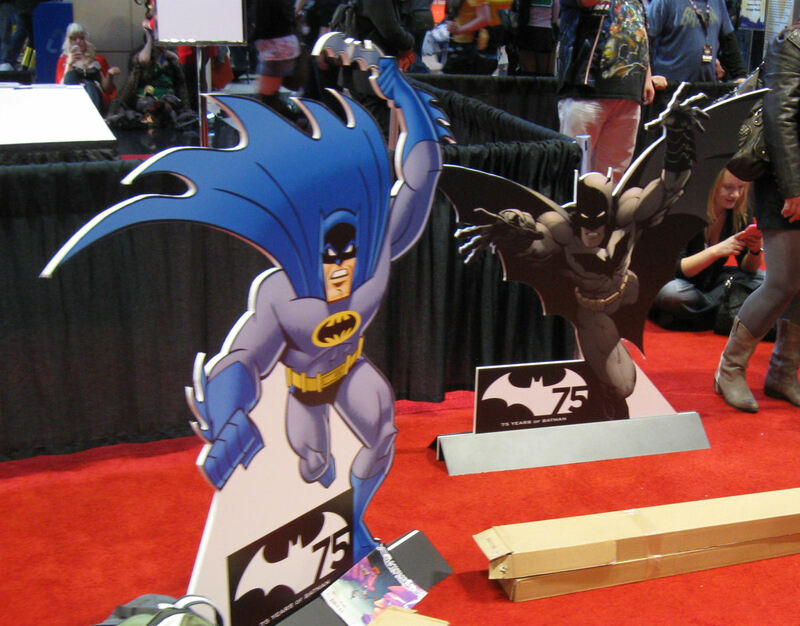 A collection of cardboard Batman standees allowed attendees to pose with the Dark Knight of their choice, from Greg Capullo’s New 52 version to the Diedrich Bader lighthearted version from Batman: The Brave and the Bold. Special section #1: Famous personalities we met. 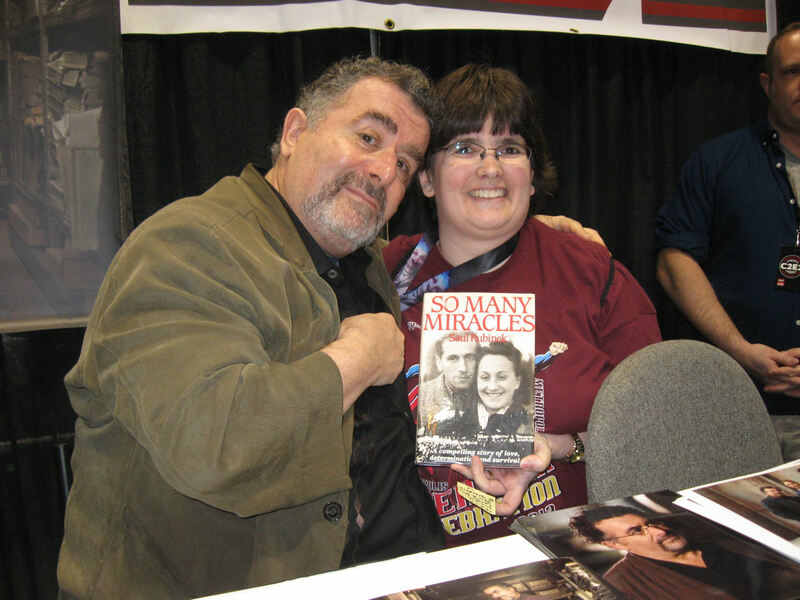 Best of Show: Saul Rubinek, best known to young folk as the star of Syfy’s Warehouse 13, but he’s one of those great character actors we’ve seen all over the place. My personal favorite would be his stint on Frasier. My wife was excited to have him autograph her copy of his book So Many Miracles, for which he interviewed his parents about how they survived the horrors of WWII Poland. Natalie Tena has been most recently been recurring as Osha on Game of Thrones, but my wife and I still know her as Tonks from the Harry Potter series. 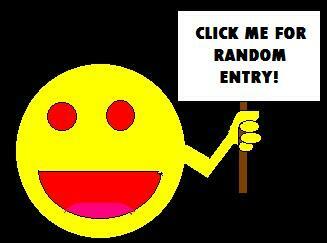 At far right, GoT’s Kristian Nairn, a.k.a. HODOR! When I heard the Ernie Hudson would be appearing as a guest, I never expected to get within 200 feet of him. For some reason, it was possible and stunningly undercharged compared to other actors’ pricing structures. We went for the photo op for three reasons: photo-op instead of autograph was a mere pittance of an upcharge; the photo-op line was being herded along much more quickly than the autograph line; and because he’s Winston Zedmore. Also, the warden from Oz, but I have yet to venture past season one. Special section #2: the one panel we attended. 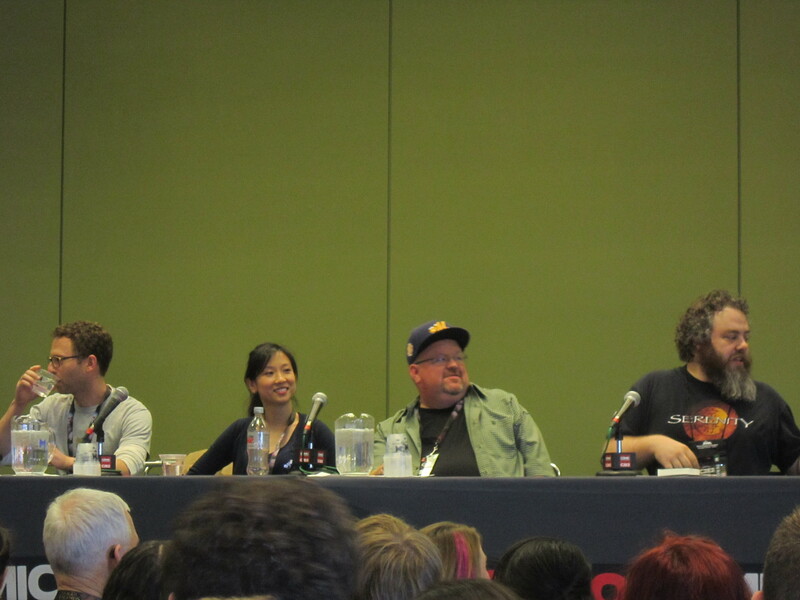 We skipped most panels this year and got caught up in other activities instead, but I cleared our schedule for one: “Geek Geek Revolution”, an informal trivia competition between authors Seth Fishman, Lydia Vang, Kevin Hearne, and Patrick Rothfuss. They were tasked with being the fastest to answer questions on assorted geek topics including but not limited to Star Wars, Back to the Future, Hitchhiker’s Guide to the Galaxy, Blade Runner, Princess Bride, Diff’rent Strokes, The Dresden Files, Zombieland, comics, the Whedonverse, Westeros, Pern, Isaac Asimov, and more more more. But not Benedict Cumberbatch. 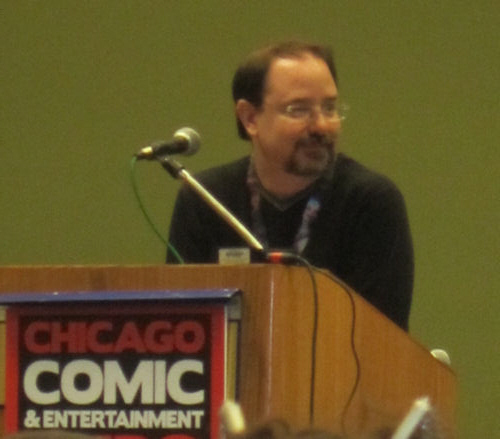 Your moderator: Hugo Award-winning novelist John Scalzi (Redshirts), whose “Whatever” blog I follow daily even though I’ve read none of his books. His stage presence was exactly as I imagined it would be. In a good way, I mean — this was no deathly grim Who Wants to Be a Millionaire? showdown, just five friends finding a unique way to hang out, fly their geek flags with pride, and entertain the heck out out of other geeks for an hour, even if I was a little disappointed that none of them could remember Hari Seldon or Detective Comics #27. Questions from the audience were another source of brow-furrowing, especially the one about Sailor Moon. Lydia Vang won by a wide margin against the guys. One could argue she was aided by the signaling system that favored those who could raise their hands most quickly, thus putting anyone with stocky arms like mine at a disadvantage. My theory was undercut when thin-limbed Fishman came in dead last. Thus was bestowed upon him the dishonor of wearing a Jar-Jar mask for ten humiliating seconds. Best comedy bit: Scalzi’s impression of Wallace Shawn. Runner-up: Hearne’s impression of Luke Skywalker, Tosche Station frequent shopper. Special section #3: comics creators we met. 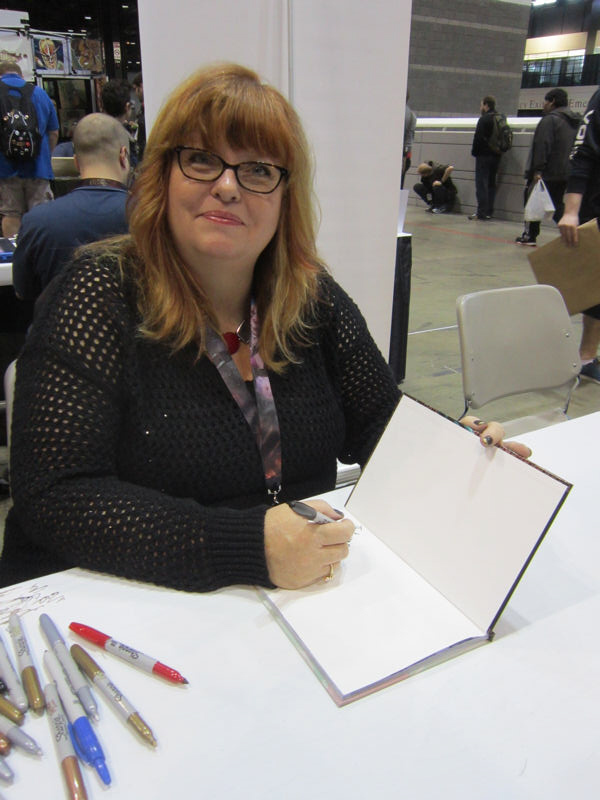 Gail Simone, whose awesome Secret Six was one of many DC Comics titles that I wish hadn’t been eliminated to make way for the New 52. Right now she’s steering the comic-book fates of Batgirl, Red Sonja, and the upcoming Tomb Raider relaunch. Her autograph line had to be capped at one point, but she was gracious enough to sign my Kickstartered copy of Leaving Megalopolis before she was swept away to her next round of appointments and devotees. 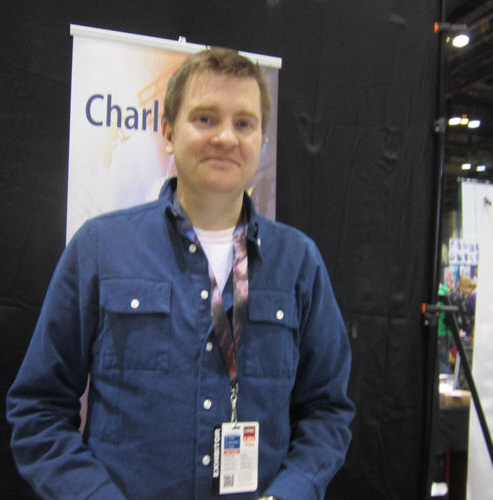 We met Charles Soule last year, but I noticed this time he had copies for sale of both volumes of his creator-owned music-thriller series 27, which we spoke about at last year’s music panel. In the past year he’s become an unstoppable writing machine for Marvel and DC, handling several books at each company, among which I count Swamp Thing and She-Hulk as monthly musts. My wife currently follows just two kinds of comics each month: most things with Star Wars on them, and DC’s uproarious Batman ’66, written by Jeff Parker. Years ago his work on the “Marvel Adventures” line made an impression on my son, who’d had trouble finding any Marvel comics that were remotely penetrable to new readers. 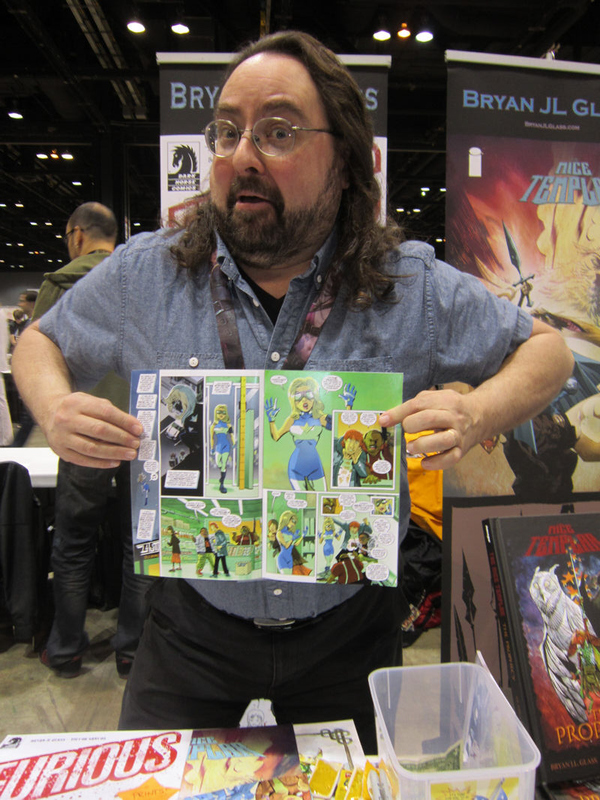 And you, too, can bring literacy to your family through the whimsy and wonder of Jeff Parker comics. Go buy all of them now. Greg Pak is currently handling Superman as well as Valiant’s Eternal Warrior, but to me he’ll always be one of the guys who helped make Marvel’s Incredible Hercules a fantastic voyage while it lasted. This appearance was a great excuse to pick up his self-published Code Monkey Save World. 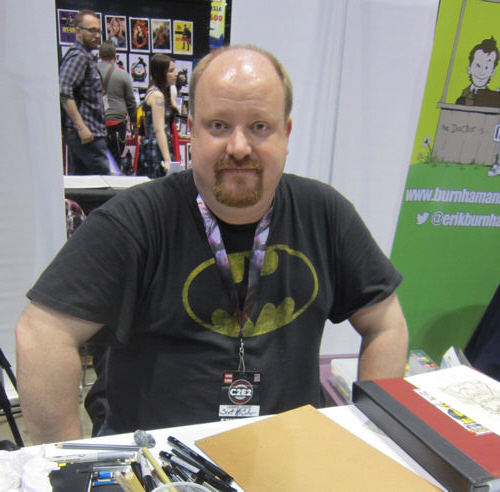 Writer/artist Scott McCullar (who’s had work published at DC) offered samples of his current work-in-progress, Thrill Seeker Comics. I’ve seen the Bryan JL Glass’ name in various Big Two solicitations, but for some reason I hadn’t tried his work before. 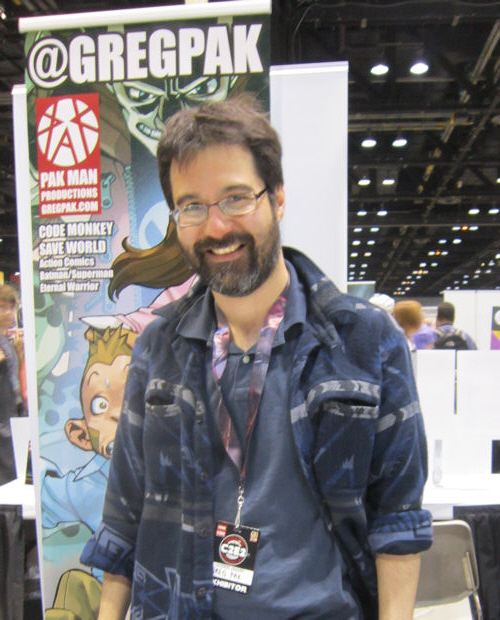 The co-creator of Mice Templar was also selling the first three issues of his current Dark Horse miniseries Furious, a dark, thought-provoking take on what super-heroics might look like if the average former Hollywood child star had an even harsher upbringing than the norm, a yen to atone for her sins, and super-powers that work best when she’s so mad she can’t see straight. It’s not a shiny-happy all-ages book, but it is a book starring a female super-hero who’s not drawn with deformed, barely covered mega-breasts. …and that’s the Saturday that was. I’m already looking forward to next year’s, Lord willing. 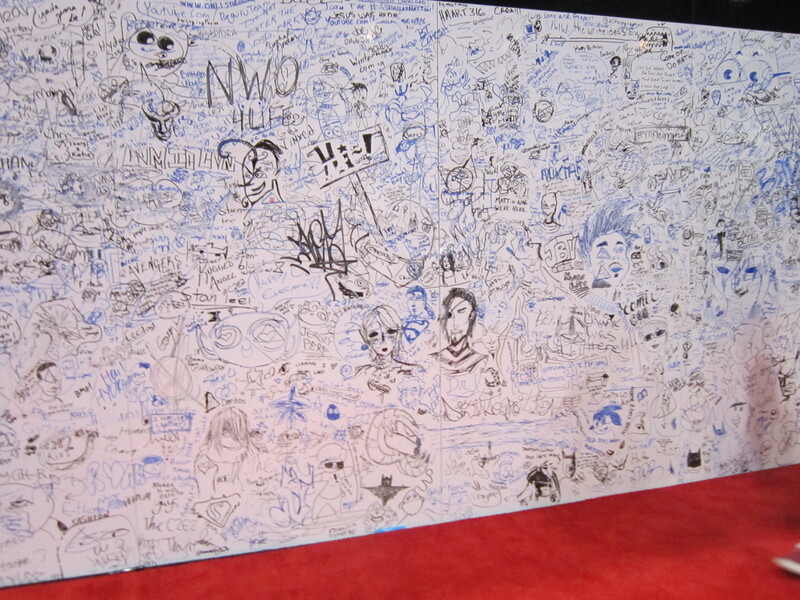 Before we exited the show floor one last time, we stopped again at the giant whiteboards to see what works had been wrought by the community at large over the previous eight hours. What had been a blank slate had turned through innumerable efforts of collaboration and/or cross-purposes into a thing of unique, temporary awe. 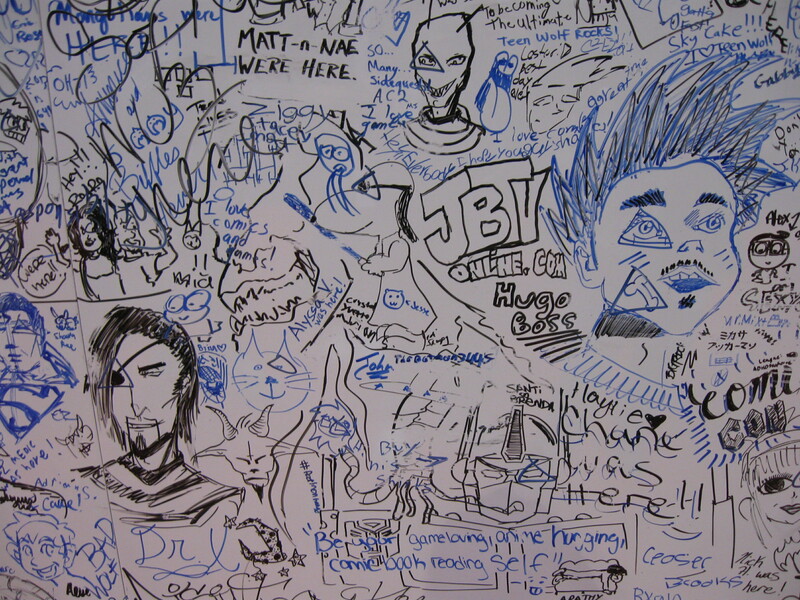 Just like the field of comics itself, it took an amalgam of personalities and talents inbound from all possible directions geographical or demographic to add their ideas, creations, scribbles, improvements, defaming, elaborations, personal plugs, or plain ol’ stream-of-consciousness graffiti to the mix. The markers were free and available to one and all — no preapproval process, no applications, no mandatory training classes, no gatekeepers to judge, no one around to tell anyone “no”. With so many shouting at once, it’s inevitable that some voices will get buried in the mix. Sometimes victory goes to those who shout the loudest. Sometimes it’s a matter of shouting better. Sometimes it’s a matter of not shouting at all. Sometimes it just takes a firm vision and a steady voice to stand out among the cacophony, a discovery in waiting for those who know where and why to keep looking. Okay, so what you want to show the world probably isn’t quite like poor, buried Jedi Snoopy up there. 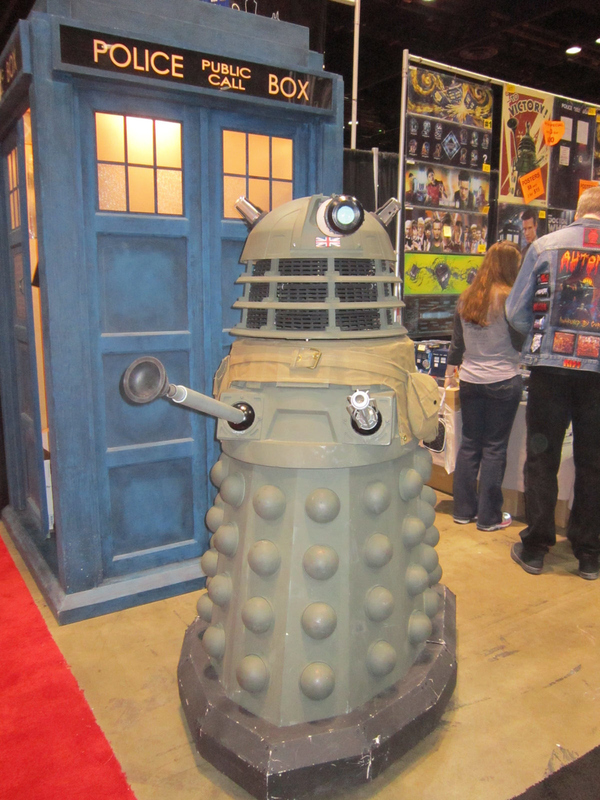 We’ll see you at our next convention, then — May 31, 2014, at Indy Pop Con. Cheers!